me & my BIG ideas and Hobby Lobby have partnered together with this post on these DIY Christmas Coasters using supplies Design Team member Jen Randall found at Hobby Lobby. "I love giving gifts during the holiday. It is always SO FUN picking out the perfect gift (or at least I hope) suited for the special people in my life. Giving handmade gifts is always a part of my Christmas celebration. 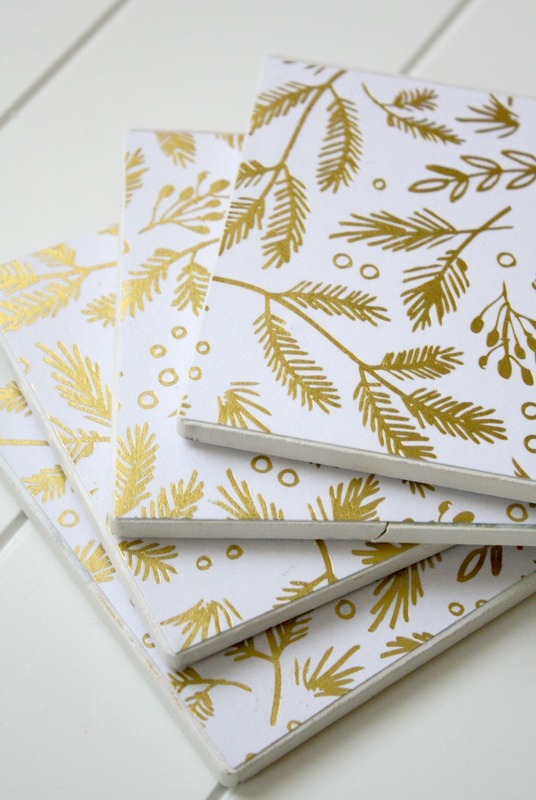 So, in November I start thinking of ideas and searching Pinterest for sparks of inspiration. A couple of years ago I made photo coasters for my mom and mother-in-law. I used super cute pics of their grandkids and they loved them! They still have them sitting on their coffee tables. 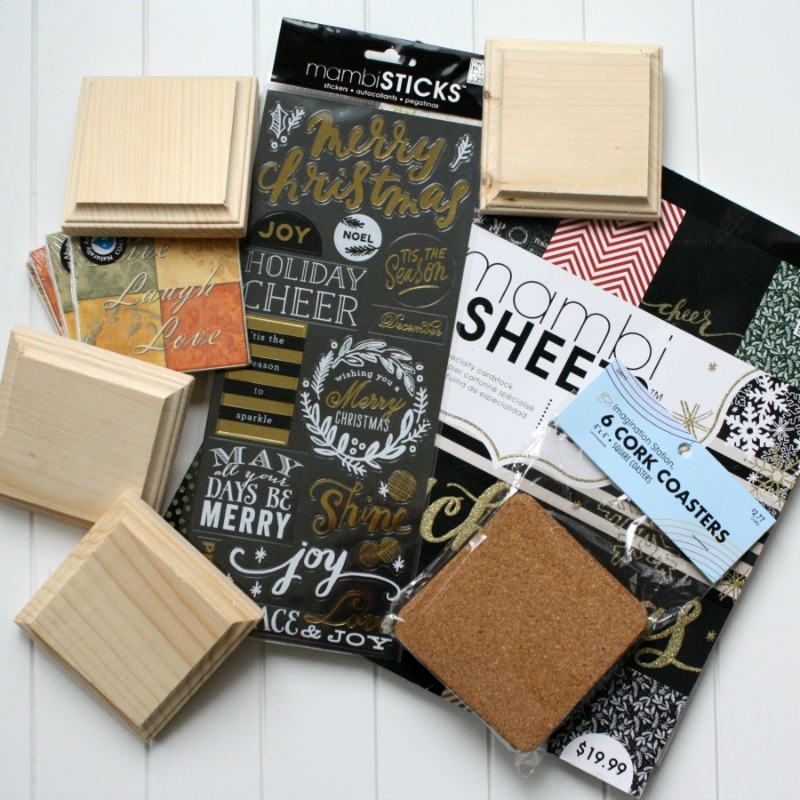 When I saw the beautiful papers in the holiday mambiSHEETS pad and the clear holiday mambiSTICKS, I knew I wanted to make coasters again this year! They really make great gifts for neighbors, teachers, co-workers, or family." mambiSHEETS, mambiSTICKS clear stickers, gesso, white acrylic paint, MODGE PODGE™, tile coasters, wood Squares from Hobby Lobby, cork squares from Hobby Lobby, spray protectant to seal and protect from liquids, hot glue, twine, and sandpaper / nail file. Quickly sand the wood to smooth the sides. A nail file works well for this. Prepare the wood by painting with gesso. Allow time to dry. Paint edges of coasters with white paint. Let dry. Measure square top and cut paper to size. Spread a good amount go MODGE PODGE™ onto the wood and back of paper. Place on wood and smooth carefully. Be sure to spread some MODGE PODGE™ on the top too. Let dry. Add a mambiSTICKS clear sticker and add a thin layer of MODGE PODGE™ over the top. Hot glue the cork pieces to the bottom. Once your coasters are ready, spray with a protectant (Jen used Krylon) outside or in a well ventilated area. Don't skip this step, as the coasters need to be protected from water. Following directions for drying time. 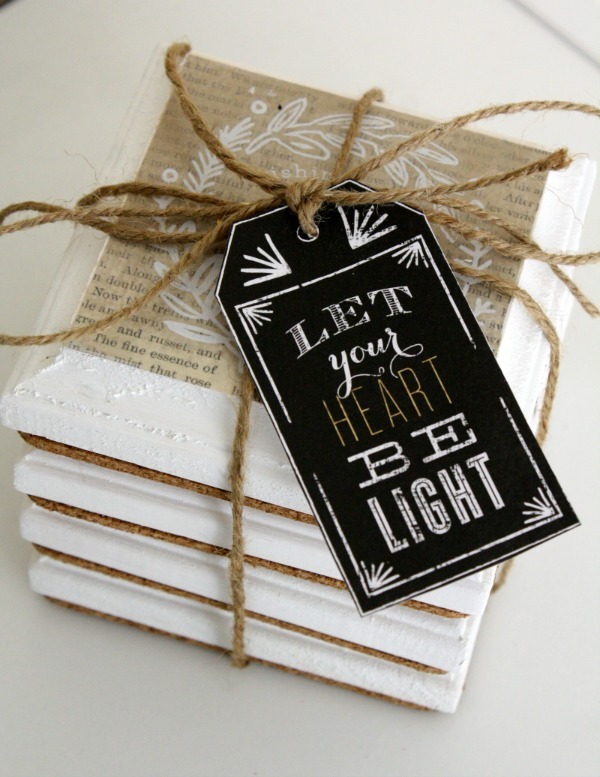 Stack them up, tie with twine, and attach a fabulous tag from mambiSHEETS. Such a great idea! Thanks for the inspiration, Jen!